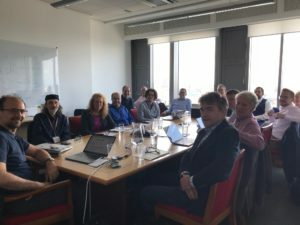 The purpose of this workshop was to bring together people from different areas and positions (Scottish government, academia, industry, and non-profit organisations) who share a common interest in e-voting, to participate in a round table discussion on the prospect of using e-voting and blockchain technologies for participatory budgeting (PB) – and other use cases – in Scotland. The workshop was partially supported by PANORAMIX and coordinated by Aggelos Kiayias and Liz Ure (Scottish Government). Besides Aggelos Kiayias, PANORAMIX was also represented by Thomas Zacharias. In this part, the attendees discussed the challenges of applying e-voting in any democratic procedure in general, and specifically, what are the requirements in PB that need to be met when technology takes over parts of the process. In more detail, there was special reference to the challenge of coming up with the right tally function given some election result, as well as the well-known conflict among the usability, integrity, and secrecy properties apparent in any voting process. A significant amount of time was spent on the eligibility problem, i.e., what is the authentication method most suitable in PB, since there are cases where people without a national ID or citizenship should be allowed to participate as members with some role in the community. Moreover, the importance of supporting participation was raised. In particular, e-voting is one aspect of the democratic procedures that people should be encouraged to be involved in, especially in the case of PB; deliberation before decision is equally crucial. Hence, any e-voting solution proposed should have the level of usability that maintains, or even enhances, the current participation rate. Finally, the educational role of utilizing security technologies like e-voting was noted. Namely, by engaging in privacy and security-preserving systems, people also become security aware and learn to separate the stake of running a democratic procedure from any other form of “lighter” social activity. 2. What existing solutions do we know about? Here, there was consensus that there is already enough experience and expertise that we can build upon, as opposed to searching for a solution from scratch. Regarding the Estonian use case, it was noted that although a good direction, it can not always be seen as the ultimate reference point. Instead, the legal framework and sociopolitical status of each country should be fundamental for the selection of the suitable e-voting system. Αs far as eligibility is concerned, besides a long-term solution of establishing digital ID for Scottish citizens, alternative authentication methods that are currently available may be considered, some of them based on biometrics. Regarding transparency of the PB proceedings, recording the transcript on a blockchain system seems to have certain advantages as, due to its decentralized nature, relying on the viability of a single company or agency is not required. On the other hand, this should not come at the cost of usability and it should be easy for PB participants to access the said transcript. In most of the cases, current solutions for running PB do not achieve a high level of security as increasing participation is the main target. From that aspect, on-line e-voting systems that do not support coercion resistance may be used, something probably not acceptable in national elections. On the other hand, on-site voting could be preferable if it is important that the “ritual” of physical participation and discussion must not die off. In the concluding session, attendees summed up their opinions, posed their considerations and discussed the next steps to be taken after this workshop. In general, it was agreed that some security properties (e.g. Privacy, Coercion Resistance, and Verifiability) may not be critical for a certain instance of PB. Still, there are reasons for these properties to be supported, since they serve as a spring board for other e-voting procedures, while they guarantee GDPR compliance. Besides, there was a positive stance on the prospect of applying e-voting for the educational reasons mentioned in the first session. With respect to the long-discussed eligibility problem, it is clear that different systems ( PB / Young Scot / National elections etc.) have different needs for identity. The idea of an open platform / ecosystems for identity providers sets a roadmap for SMEs that avoids a monopoly. In addition, the solution of an attribute-based ID could resolve any issue of participation for community members that are not Scottish citizens. The workshop was concluded with the promise that a follow up meeting will soon take place, including more people interested in the topic who can contribute additional ideas.